Although this blog has from the onset been based mainly on physical journies, it has always been the aim to focus also on spiritual journies and the journey of life. For me this summer has been one of these journies. Not quite the spiritual journey of India, but one of realising that sometimes you just have to go with the flow of life; take different paths and see where they lead. Rather than dwelling on the disappointment I felt for myself at my lack of cycling ability, I have started to realise I should have listened to my instincts which told me long ago I was not ready for an adventure of such a scale. Leaving my job, getting ready to start a new one, moving house and preparing to live in a new country comes with it’s stresses and I was naïve to think I would be able to up and leave in a carefree state and embark on a summer of adventures. Well, perhaps not naïve as I have essentially done this, but Adventurous Annie was trapped in a metal cage, whilst nervous panicky me was oozing out of a broken eggshell that had been carefully cracking for a while. On that drive to Istria I would go so far to say that at least half the shell fell off! The drive was stunning for the most part, until after around 4 hours on the same motorway we got a bit bored of concrete…and each other. 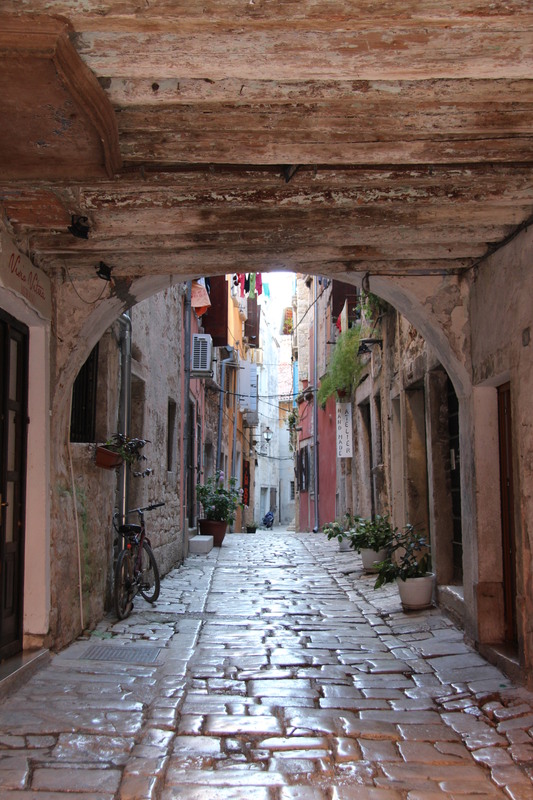 Many people think that travelling is a doss, but it is also filled with a lot of problem solving and stressful moments when things don’t go as planned. It had taken it’s toll and we were ratty with each other. After a while it reached ‘flashpoint’ as Andy calls it and we were having a huge row (it did give us something other than the concrete view to focus on at least). 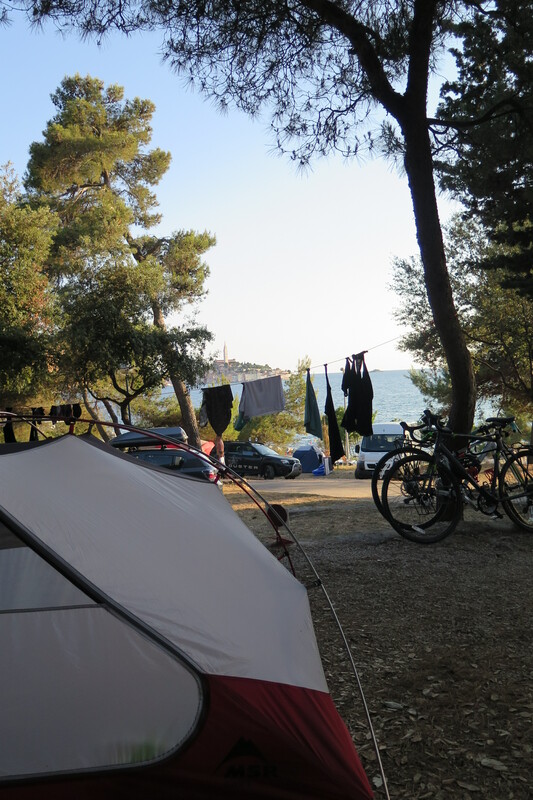 Finally we pulled into the campsite we had planned on staying at just north of Rovinj. 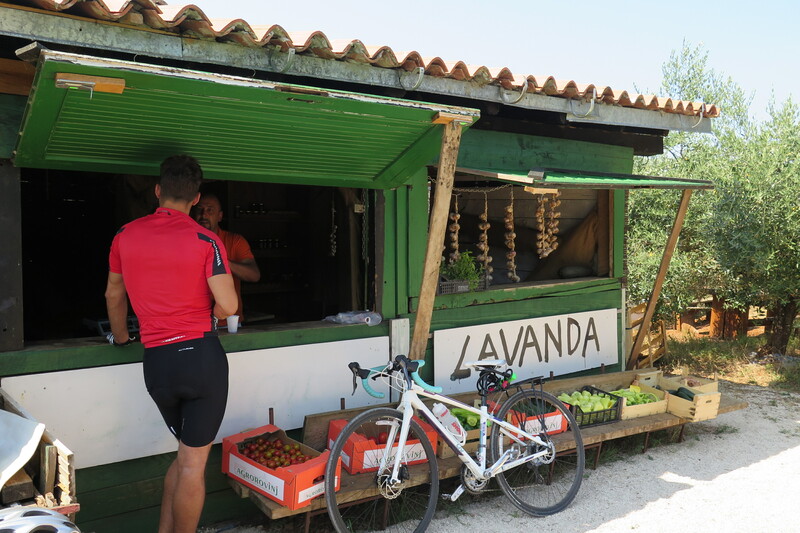 The scenery was beautiful, more like the South of France than Croatia with rolling hills, vineyards and little tavernas along the roadside. Unfortunately the campsite was more like a religious cult hang out for people with no clothes, imprisoned in a 12 foot fenced campus. There were hundreds of them and the vibe was just horrible, it was like being at a naked Butlins and there seemed little natural about the naturism. 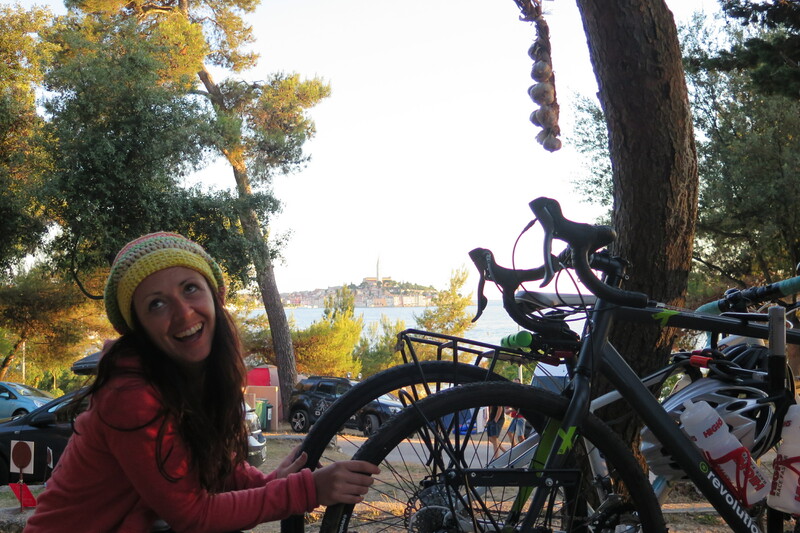 Venturing south to other recommended sites would pose a few problems: we had agreed to drop the car off at Porec, from where Andy would cycle back to the camp. 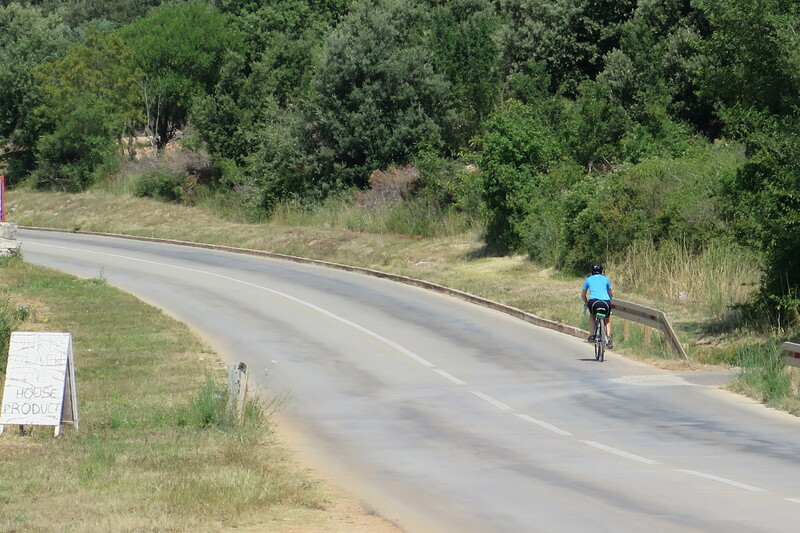 The next set of campsites took us around an estuary that added another 20km onto the ride. Still, we headed off. Bar the mammoth hill we climbed at the foot of the estuary, the rest of the roads looked like good cycling ground. On our way to the next campsite we passed ‘The Cobra Club’, a swingers club according to it’s sign. It was all a bit seedy, and the camp did nothing to dispel this aura. Added to this, they were charging 52 euros a night for a pitch!!! 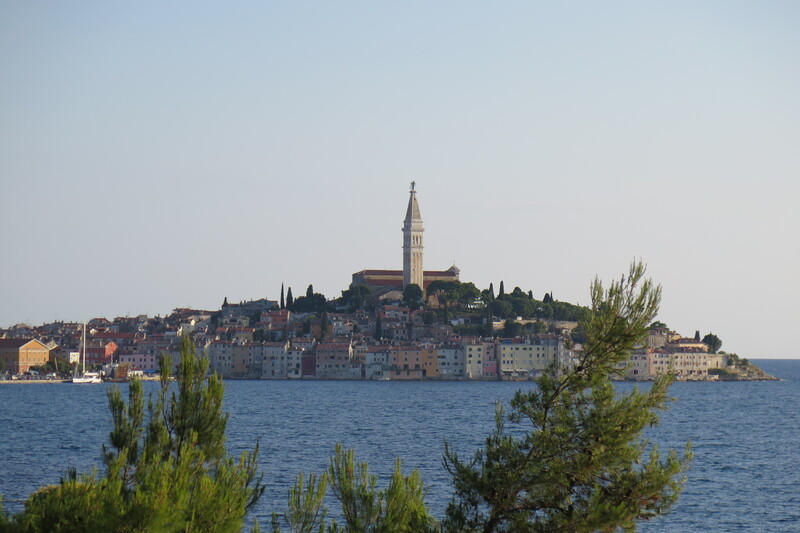 We made our way back towards the city of Rovinj where we had passed a roadside campground. We were needing some kind of base from which to take the car back. 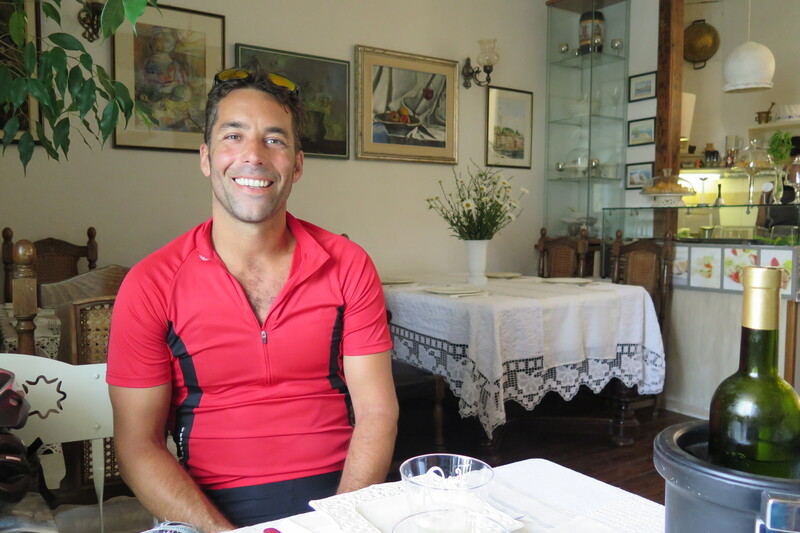 A friendly face welcomed us at the reception and informed us we could have a pitch for 21 euros a night. It was a steal compared to other options and we managed to bag ourselves a spot with quite possibly the best campsite view over a city I have ever had. All pitched up with our newly nabbed washing line! The next morning Andy set off in the car with his bike in the back. The weather had turned overcast, mirroring my mood, so I headed into town on the bike and sussed out the options. It was great to cycle with no bags on the back. Andy had informed me that he would be back by midday and in 1 hour 20 minutes he had managed to cycle the 40+kms back to the campsite despite facing serious headwinds. He looked energised from the exercise and after a shower we headed into town to come up with a plan. 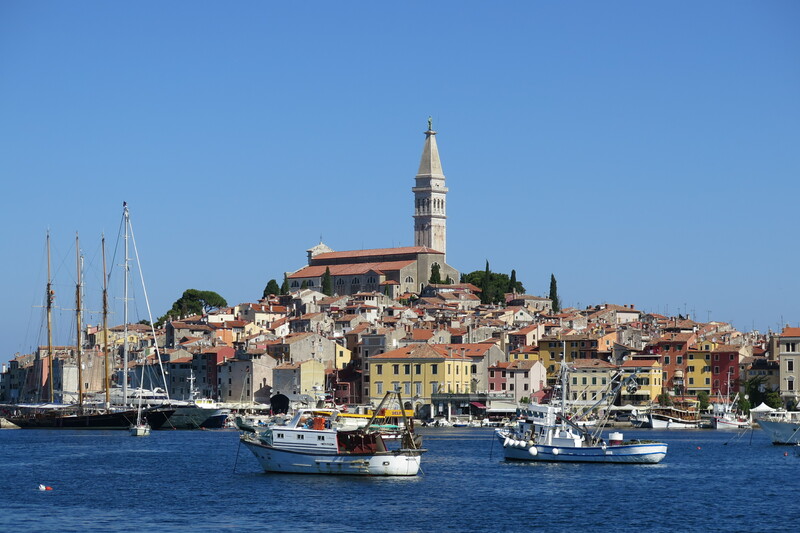 We found out we could get a boat from here to Venice, from where we would be able to get the train to Bari and a ferry from there to Greece and we could work the rest out nearer the time. This meant we had a week until we needed to make a move, and so we decided to do something that we never do; sit still! Now when I say sit still, I mean we kept our tent in the same place. We, on the other hand, went out on the bikes everyday exploring the area. 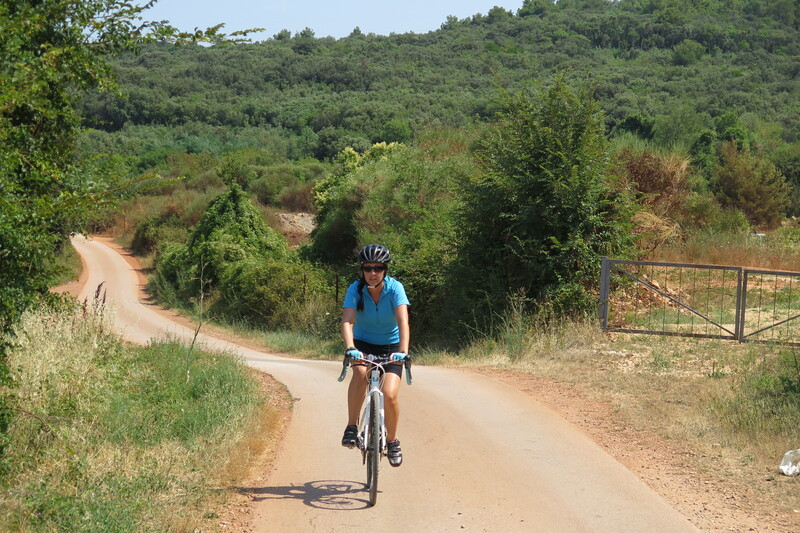 The countryside was lush with vineyards, olive groves and various herbs (the smell of which hit you as you cycled past). 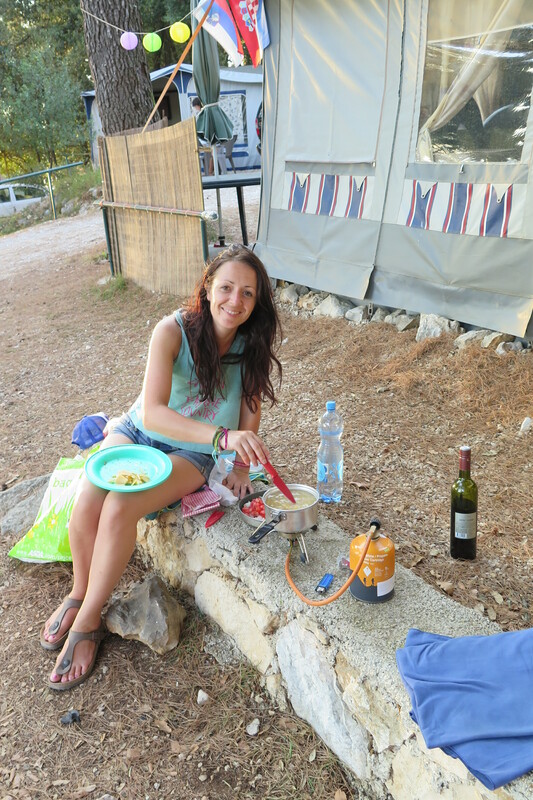 We visited a couple of the local islands, cooked delicious meals with our limited cooking equipment and made friends with some of our neighbours on the site. 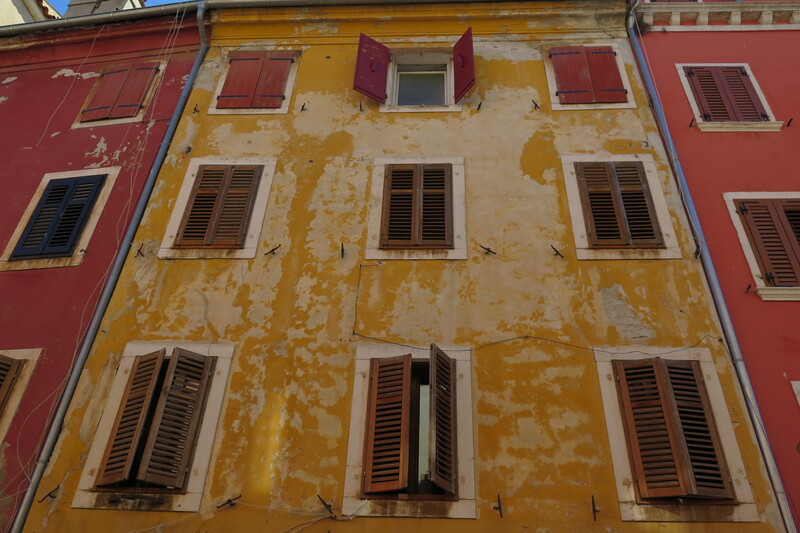 Rovinj is a stunning city, but filled with tourists. We opted to visit early in the morning to get some photos. 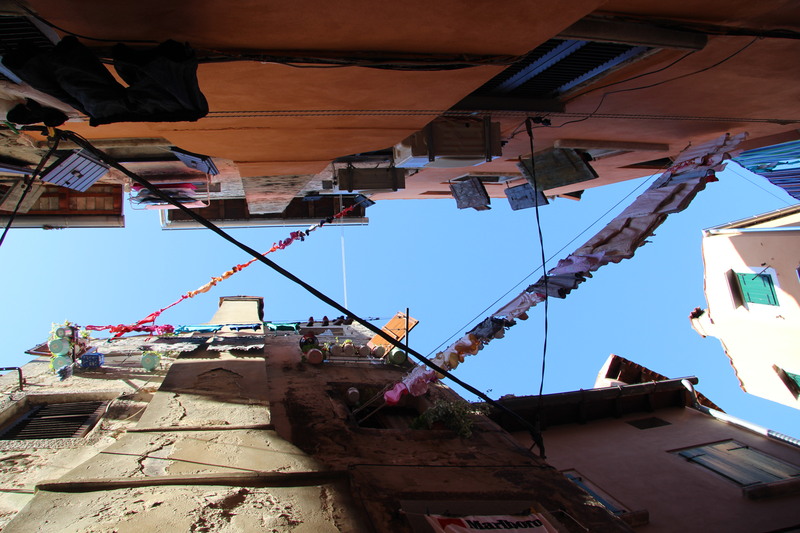 We found a couple of special places to eat including Madeline’s Place, which is literally an old lady’s living room overhanging the sea serving local tapas delicacies. Another treat was Sergio’s Pizza place where we ate the best pizza we have ever eaten! It was a cheap, relaxing week in a beautiful spot and finally we began to feel relaxed. Sometimes changing plans totally and accepting going in a new direction opens your eyes to different experiences. Prior to that week the only direction I had been heading in was straight to an emotional breakdown. Re-routing not only meant we were able to reach our destination in Greece, but also that I had finally reached the emotional place my body and mind had been craving, that I had pretended it didn’t need to go.